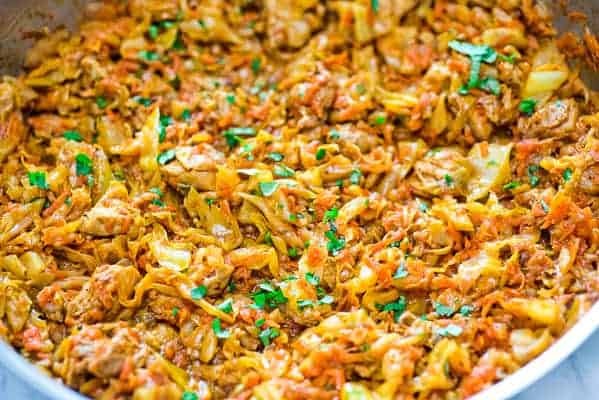 This succulent Cabbage and Chicken is hearty, filling, and so delicious. Just a few ingredients and about 15 minutes of active cooking time make up this amazing dinner. This is my #1 Best Recipe yet! This recipe has never failed me. It gets “Ooohs” and “Aaahs” from my family and friends every time I make it! 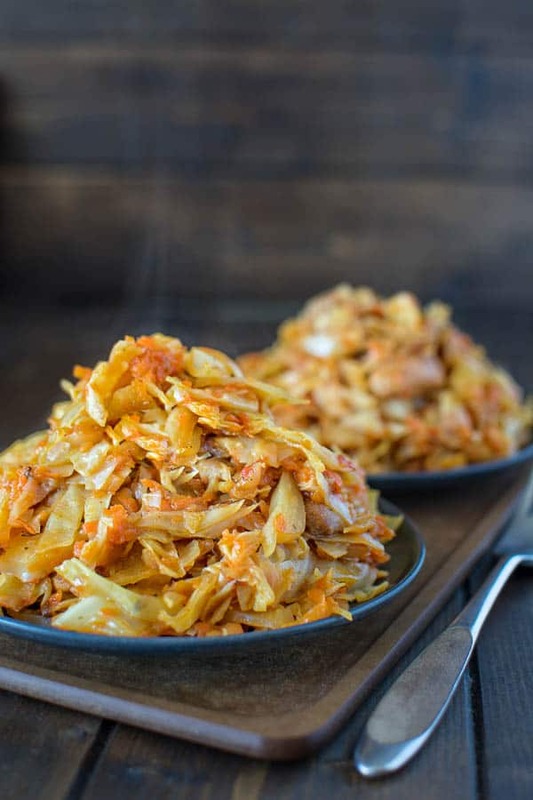 This Sautéed Cabbage with Chicken is so flavorful, filling, and healthy that I cannot say enough good things about it. It is a MUST TRY and I hope you won’t skip this recipe. This dish is also pretty easy to cook. It takes about 15 minutes of active cooking time and 45 more minutes to finish on the stove. Not bad, right? You can clean up the kitchen and set up the dinner table while the dish is cooking. 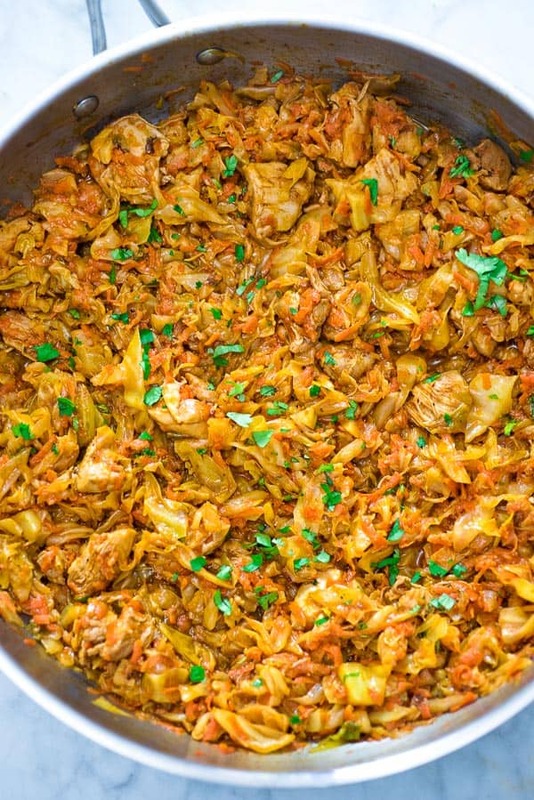 WHAT KIND OF PAPRIKA TO USE FOR CABBAGE WITH CHICKEN? So many of you have asked me about the kind of paprika I use in this recipe. I recommend using sweet paprika. Typically just labeled as paprika, it has a sweet pepper flavor, without any heat. This paprika is sold in most grocery stores, since it is a very popular kind. You can also buy sweet paprika on Amazon. 1. Warm up a large sauté pan over medium-high heat. Add the olive oil and chicken. Fry for 5-7 minutes or until browned. 2. Meanwhile, slice the cabbage into thin strips, just like you would for coleslaw. 3. Add the paprika and tomato paste to the chicken. Stir, and then sauté for another five minutes. 4. Add the cabbage and cook for five more minutes. 5. Add the shredded carrots, chicken stock, salt, and pepper. Stir everything together. 6. Cook without the lid, stirring occasionally, for about 40 minutes, until there is no liquid remaining. 7. Add 1 tablespoon of hot sauce, if desired. Garnish with fresh parsley. Serve the cabbage with some rice or mashed potatoes on the side (check out my Mashed Potatoes with a Secret recipe) and sprinkle it with fresh chopped parsley. Don’t forget to share how you liked this recipe!!! Succulent cabbage sauteed with tender chicken and vegetables. Just a few ingredients and about 15 minutes of active time make up this delicious dinner. This is my #1 Best Recipe yet! Warm up a large sauté pan over medium-high heat. Add the olive oil and chicken. Fry for 5-7 minutes or until browned. Meanwhile, slice the cabbage into thin strips, just like you would for coleslaw. Add the paprika and tomato paste to the chicken. Stir, and then sauté for another five minutes. Add the cabbage and cook for five more minutes. Add the shredded carrots, chicken stock, salt, and pepper. Stir everything together. Cook without the lid, stirring occasionally, for about 40 minutes, until there is no liquid remaining. Add 1 tablespoon of hot sauce, if desired. Garnish with fresh parsley. Hi Michelle! I am not sure what capsicum red colour is. You can use your favorite chicken seasoning instead of paprika. Thanks! Hi, I just made this for tonight’s dinner…I know my family will love it! I had smoky paprika and it turned out awsome! I made a califlower mash potatoe and a green salad! Thank you for a great recipe!! I sauteed an onion with the chicken, used tomato sauce instead of paste and sweet paprika instead of smoked, as this is what I had on hand. Love this recipe – did add full amount of paprika, no carrots, also added a full onion and I can diced tomatoes and garlic and bay leaves. YUM. To add a little more flavor I tried some vinegar drizzled over and it was great German flavor. Then in bowl 2 I tried a drizzle of soy sauce. Delicious. Definitely a keeper! Thank you so much for this recipe!!!! It has completely changed my relationship with kapusta. I felt like a bad Ukrainian before because I hated it, but now I can’t get enough of it (well this recipe anyways). This is amazing, and tastes even better as leftovers. Hi Olesya! Thank you so much! I am so so so happy to be able to help you change your relationship with kapusta. Please, try this The Best Fried Cabbage: https://cooktoria.com/fried-cabbage/. You are going to love it too. Thanks again for stopping by, and have a happy Thanksgiving! Hi Nigel! Accept my condolences about your father. No, I’ve never heard of a recipe like that. We don’t use curry at all in Ukrainian cuisine. He must have picked up the recipe in the US, or even created it. Thank you so much for stopping by. If you do give my Chicken and Cabbage recipe a try, I’d love to hear your feedback. Best regards! Made this tonight & it was so delicious, will definitely be making it many more times. The one chance I made was to use chicken breasts marinated in herbs & garlic- it added so much more flavour! Hi Melanie! I am so happy you enjoyed it! Marinating the chicken definitely adds extra flavor. My husband and I loved this. I made the recipe as it said but I added 1/2 can of MUIR GLEN organic fire roasted crushed tomatoes and after reading the reviews I also added the egg noodles. I had to use 1 1/2 cups of chicken stock a little more due to cooking the egg noodles. Then I also added some chicken bouillon powder. It was so yummy. I will definitely make this dish again. The egg noodles really makes the dish tasty. Have you ever tried chicken breast meat? Does the chicken dry out, leaving it in with the cabbage to cook that long? I’m trying this tonight! Yes, chicken breast meat does turn out to be a little dry. That is why I prefer dark chicken meat. Let me know if you tried it, how how it turned out. Thanks!! This recipe looks amazing. I am not used to cooking with Cabbage and I am wondering if cooking it for 45 minutes leaves the cabbage soggy or not. I think that my husband and I would still like a crunch to it. Any ideas as to how to achieve that cause you are cooking it until all the liquid is gone, maybe cutting the liquid in half? Hi Marie! Yes, the cabbage turns out soft at the end. If you’d like a crunch, I would suggest skipping liquid all together, and just saute the cabbage with chicken until you achieve desired results. Thank you! Very nice, I’m glad you insisted on it being good, because the ingredients make it look bland, but it really wasn’t. I used double the chicken, it didn’t need it, that’s just how much I had. 4lbs of cabbage seemed a lot, but it eventually cooks down. This must be the healthiest meal I have eaten in a long time, and I will make again. Also I usually don’t enjoy cabbage and just eat it for the nutrition, but this was genuinely nice. Wow! Thank you so much for the feedback, Ben! I am glad you enjoyed the cabbage. I made this recipe tonight! It was delicious…I used smoked paprika and 2 garlic cloves. My husband loved it! A true miracle since he’s not excited about ‘healthy’ dinners. I served it wit basmati rice! Will definitely make it again! Thank you so much!! Thank you so much, Pamela! I have made this eight times now. You can totally cheat and just buy two bags of pre shredded coleslaw– it even comes with the carrots in it. Furthermore, instead of paprika, I use an incredibly flavorful Ethiopian spice blend called Berbere, which is paprika based. It makes the whole thing hot, spicy, exotic– kinda the opposite of what you were aiming for but definitely still a comfort food. If you have any, try it. You’ll love it as much as me. I’m making it again this week actually. Last week’s wasn’t enough. And I’m excited to see what else you do with the Berbere! I love your stuff! I follow you on Pinterest. I know it’s been a minute, but how much berbere did you use? Hi Nancy! Not sure if Kate will see this. I did buy Berbere seasoning as she recommended. It’s my favorite seasoning now! You’ll need about 1 tsp. in this recipe. Also, you may adjust and add more if you feel like it. Thanks! Wow! I made this for dinner last night and the taste was amazing! Reminds me of dishes my Slovak grandmother used to make when I was a child. True comfort food. To be honest, I did cheat (a little!) and used two bags of pre-sliced white cabbage and half a bag of shredded carrots. Also, just dumped two cans of petite diced tomatoes in because I did not want to haul out the food processor. Finally, I threw in an 8 oz bag of egg noodles towards the end because I love the cabbage/noodle combination. The noodles helped absorb any excess liquid. Dish was a big hit with the family and I am looking forward to leftovers for lunch the next couple of days. Thanks so much for posting this recipe! This was soooo good! I followed your recipe almost exactly but added one cube of those frozen garlic cubes you buy at the store. I also made the mistake of putting the lid on it. Maybe put on the directions list not to cover with the lid. But it wasn’t a problem. I just let it cook longer and turned up the heat a little bit and let it cook longer. Will definitely be making this again!! Thank you so much for the recipe! Thank you so much, Kari! I did update the recipe, so it is clear to other readers. All the best! I made this dish for myself and my husband and we LOVED it!!! I can’t wait to serve it to company. Thank you so much for sharing. I just made this, this evening. It was very wet, like soup. Not sure if I cooked the cabbage too Long? Added too much stock? It was still really good. I’m just trying to figure out what a ‘small’ cabbage would be considered, weight wise. I love cabbage and it was soggy so I’m assuming I fried it too long with chicken. Hi Megan! I am sorry this recipe didn’t work out well for you. I cooked this recipe so many times, and recently I bought a cabbage from different store and I had the same problem. I guess there different types of cabbage out there. You may have had the same issue. “Small” is about 4 lb. Try adding less stock next time and let me know how it worked out. Thank you!!! This looks so good and would fit into my current diet seamlessly! I just started cooking with cabbage, and I wish I would have started sooner. Thanks for the recipe! Had chicken thawed out for dinner but didn’t want to cook something we always have. Checked my recipes on Pinterest. Nothing there. Checked through my saved links on fb and came across this one. Yep had all the ingredients ☺ Glad there are only 4 of us. Had it on basmati rice as a main. Loved it, hubby loved it and both my kids bowls are empty. One question … what sort of paprika do you us? I used sweet and it was fine. Hi Kirsty! That’s great, I am happy that your family enjoyed this recipe. I serve it with rice quite often. Yes, I use regular sweet paprika. Have a great day, my friend! Love this dish, I also add a parsnip to mine, if I don’t have any I add cauliflower 15 min before it’s finished so it doesn’t go mushy, I have this at least 2X’s a week as I love cabbage. Hi Linda! I am happy you enjoyed the recipe. Love the cauliflower idea! Has anyone ever tried adding cooked bacon in pieces to this recipe? Just got home from a 7 hour drive and all I had in my fridge was literally cabbage, carrots and chicken and had no idea what to do with them. This was perfect. So simple!! My spice rack is slim due to just moving so didn’t have bay leaves or a substitute and just used tomato sauce with lots of paprika, salt and pepper and this was still delicious!! Thanks for posting! This is now saved in my go-to recipe box. Can’t wait to remake with the proper ingredients! Thank you! This recipe is delicious! I’ve made it several times and bookmarked the recipe 🙂 Thank you so much for sharing! I love cabbage and have started to eat mostly chicken and fish . I was excited to have found this recipe on Facebook. I just tried it tonight and it came out great. Such a simple , inexpensive, healthy and tasty recipe. This is definitely a keeper. Thank you for the recipe! I made this for dinner tonight and the whole family loved it. Three of of three kids went back for seconds! I made it as a one pot dinner rather than a side. I used three large chicken breasts chopped into small pieces and I cooked it completely and then removed it so it wouldn’t get overcooked while the veggies cooked. I also added a Knorr chicken bouillon cube and left out the stock as once my cabbage started to cook down I had a lot of liquid. It took the whole 45 minutes to reduce the liquid. I added my chicken pieces and a bit of garlic salt when the cabbage mixture was done. It was delicious and filling. I will be making this again soon. Thanks for the great recipe! Sooooo I’m trying to eat more raw foods, so I cooked the tomatoes and spices separate from the cabbage and carrots. Poured it overtop of everything and mixed it all together….yummmmmmmm. And it’s still alive! Thanks for the recipe…this is a keeper! wow, this is wonderfully delicious! I had a mound of already shredded cabbabe and some chicken in the freezer so I googled to see what I could make with a chicken and cabbage combination and your recipe came up. So simple, healthy and yummy. I’ve bookmarked your site so I can try other recipes. Thank you so much for posting it! Tonight I had mine with quinoa. Yum. Hi Rika! That’s really an honor when someone bookmarks my site. Thank you so much for sharing and I hope you’ll find a lot of deliciousness here :-). My favorite rice by far is basmati rice, Bea! Thanks, Bryan! I truly appreciate it, and I am happy your kids enjoyed the cabbage. Come back for more! That’s truly an honor when someone has my site pinned! Thank you so much, Bryan! I hope you’ll find a lot of delicious recipes here. I am no chef as well, I am just passionate about cooking and feeding people. 🙂 All the best to you, my friend! Do you use fresh bay leaves or dry and the remove them? I use dry bay leaves and remove them after cooking, Amanda. Enjoy! This is AMAZING. Hubby didn’t want chicken and cabbage when i first started making this recipe. After discussing other options he changed his mind but 8 servings wasn’t enough, needed 16. Glad I doubled the recipe, very filling, had leftovers.I used 1 chicken bouillon cube instead of stock.I saved to my Yummly Recipes.I served sweet potatoes as my side, need to find somethjng low carb. Thanks for sharing, Mindi! I never served it with sweet potatoes, but it sounds like a great idea! It is cooking now and smells divine! I do have a question though. The 1/2 pound of chicken doesn’t seem like enough for 8 servings – that is just 1/2 ounce per person if my math is right. Was that a typo in the recipe or is the recipe correct? I think next time I will add a little more. Also, have you ever frozen and reheated this dish? Made this tonight, really tasty but took forever for the stock to evaporate, maybe too much used? Try using less stock next time, Bryan. Also, do not cover with lid while cooking. Thank you for the feedback! Hi No.5 Add tomato, chicken stock, carrots and bay leaves. Season with some salt and pepper. Stir everything together. Reduce heat to low, and cover with a tight lid. Have you made this with chicken breasts rather than thighs? Hi Carol! I did. Chicken breast works too, but it’ll be a little dry. Hope you’ll enjoy the recipe! Made this tonight, found it on Pinterest. It was AMAZING! Served it with rice, why because we love rice. Added more chicken, onion and a little sesame oil. Thanks for the recipe! What if you only have sour cabbage available? How would you prepare it for this recipe? Hi Sabrina! I’m interested to find out. 🙂 I’ll cook it with sour cabbage soon and let you know! Can you use canned tomatoes, & if so much much would you use? Hi Nikki! I’d use about 8oz. of canned tomatoes (1/2 can). Soooooo yum!! Omg!! This is the second time I’m making it so I can have some ready to go! Only thing I’d say is olive oil on high heat is definitely not a good idea, goes rancid… I used coconut oil. Thanks, Mary! I am glad you liked it! I made this today with trader joes shredded cabbage and carrots plus canned dice tomato. It was very good. I need to double the meat next time. Great to hear! Thanks for sharing, Mtview! Just curious how this would be for meal prep? &; I made a certain amount of dishes of it for the week. Would it be something that would stay and be heated up well? Thank you! Hi Janae! Yes, you could use this recipe for meal prep. It stays up to 4 days in refrigerator and tastes great when reheated. This was amazing. I added garlic and also added soy sauce. The soy took it over he tip. I am happy you enjoyed it, Barbara! Omg, so yummy! Made this tonight and it turned out fab. I did add onion and garlic to the chicken while sautéing and used chicken breast instead. Also used one can of diced tomatoes because I didn’t have fresh, and only half cup of stock. Can’t wait to have the leftovers for lunch tomorrow! Great! Thanks for sharing, Hamsterwheel! Hi Tania! I usually don’t take the time to write reviews ? but I just made this dish Exactly like your recipe and it is Absolutely DELICIOUS!!! We Ooohed and ahhhed over our bowls and couldn’t say enough nice things!!! Thank YOU so much for sharing, it is unbelievable how such a simple, quick recipe tastes like it took all day to make! Hands down the best dish I found on Pinterest. It’s the perfect dish for a lazy, rainy Saturday afternoon! Thanks a Million for sharing. Thank you so much, Preena! You just made my day, friend! This was delicious! Thank you for sharing! Thanks, Whit! I am glad you liked it! The recipe calls for 1 tbsp of paprika but you said you use 3 tbsps. How much should I use? Delicious. I sautéed a chopped onion first, then added 2 cloves of chopped garlic. Then the rest of the ingredients. Trick: I used 2 bags of store bought coleslaw and an organic rotisserie chicken. I also switched out smoked paprika for the sweet paprika. I made this dish night. I seasoned my chicken before browning it and I added chopped onions and garlic. My whole family loved it. They all agreed that I can fix it again. Great! Thank you for sharing, Patricia! Great! Thanks for sharing, Richard! Good evening I tryed the recipe it was delicious I forgot to buy bays leafs that did not stop me from preparing it I added green, red,in yellow peppers in fresh garlic out of this world. Thank you for sharing the recipe. Making right now, I added onion, green bell pepper, 1 small hot pepper, and fire roasted tomatoes. Sounds good! How did you like the result, Rusty? This was a huge success for the whole family! Even the kids asked for more! Having a ukrainian husband, it was great to try a ukrainian dish. He was so happy to eat something that reminded him nice family memories! Might try the cherry wontons one of these days! Hi Daniela! I’m glad your family enjoyed this recipe. The cherries are in season now, so hopefully you’ll give the wontons a try! Best wishes! Great to hear that, Beth! Have a great evening! I don’t use my food processor very often, and I’ve never pureed tomatoes in it before. My 3 tomatoes turned into a whole lot of frothy, watery, tomato juice. Did I overdo it, or is that what it was supposed to look like? Between that and the cup of chicken stock, there is a LOT of liquid to be absorbed. Hi Lynette! You probably overdid it a little, but it still should be ok. Just cook the cabbage without the lid, so the liquid will evaporate. Let me know how it turned out. Hi I was just wondering if you can cook it in a slow cooker and can you use chicken brest insted ? Hi Pamela! You can certainly cook it in slow cooker and use chicken breast instead. The reason I prefer chicken thighs is because they tend to be more soft, tender and succulent. All the best to you! I am glad to hear that you loved the recipe, Matt! I’ve never cooked with Bay Leaves. I bought some specifically to make this dish. However, I’ve seem several videos of people using bay leaves. And so many remove the bay after the dish is completed. Is that something to do with this dish? Will it break into pieces when I add it to the dish and stir it around? Sorry if these are stupid questions! Like I said, I’ve never cooked with it before! Hi Kayla! Bay leaves just add a little extra flavor. I use it is almost all soups I cook, and in many dishes. It doesn’t break (unless you really try 🙂 ) and it should be removed after the cooking process. Hope you’ll give this a try. I just made this tonight and it turned out soooooo spicy. Like so spicy we couldn’t eat it. Is 3 tbsp the correct amount of paprika to use?! Feel free to share the photo of the paprika you used on my Facebook page, I’d love to see what went wrong. Approximately how much cabbage would you use? Cups wise. Approximately 12-14 cups, Ashten. Thanks! I suspect that those who ended with a tasteless dish used paprika that was too old. Paprika is cheap and should be discarded after 12 months. I discard mine after 6. Followed your recipe to a T and it turned out great. Thank you for a wonderful, budget friendly recipe. Thank you so much for sharing, Judy! I never thought about that, because I use A LOT of paprika and it never stays more than 2-3 months. I am happy you enjoyed the recipe! Omg, I discovered a new store Savory Spice…they sell just about everything imaginable. It’s amazing the difference in taste between their items and supermarket spices. You never know how long they’ve been sitting before you even buy them. Most herbs and spices are processed during the short harvest season of their ingredients only once a year. So discarding Paprika every 6 months doesn’t guarantee you are getting something any fresher than what is in your pantry. The two things that do cause your spices to lose potency are heat and light. So storing them on the counter, in an open spice rack,close to the stove, or in a cupboard over the fridge – all of these things will contribute to them deteriorating faster. The other smart thing to do is purchase your spices from a store with a high turnover, or a specialty spice merchant online. I’m making it again today. How could something so simple be so delish. Gol bless you for sharing! Awww.. That’s so sweet, Wendy! I am craving it pretty often too! All the best to you, my friend! This is beyond delicious!! I only used 2T of oil and boneless skinless chicken breasts to make it more Weight Watchers friendly. I puréed grape tomatoes and added minced garlic, Italian seasoning and salt. I used prepackaged coleslaw mixed and preshredded carrots. Holy cow. Thanks for the fantastic inspiration! Approximately how much tablespoons of canned tomato purée would be needed for servings size of 8? We loved this dish. I doubled the chicken, which turned out great. I think next time we’ll add onions like others did here. Thanks for a great easy dish! I make this all the time with Turkey Sausage to cut down a bit on the calories and absolutely love it. Haven’t tried it with chicken thighs but sure will in the near future! I’m wondering how turkey sausage cuts down on the calories from chicken? I used chicken breasts because they are lower calories than thighs as the recipe calls for but I wonder about the turkey sausage being lower. Made this tonight and will definitely make again. Already sharing with friends. I didn’t have the three tomatoes, but I had a can of tomato sauce. I’d rather do the fresh next time, but it was still yummy. I also added 2 cloves of garlic and 1/2 white onion. Great! I am very happy you enjoyed it, Alex!!! I found this after searching for recipes to use a prepackaged coleslaw mix. I’m making it with a vegan “chicken” strips product, and I like Carol Lundgren’s idea of adding peppers, which I also have “laying around”. Does it really take 45 minutes to come together and absorb the broth? I was thinking of something like a stir-fry, but that seems more stew-like. Guess I have to see about adapting it– don’t have a lot of time…. It is definitely more like a stew, Nicola. 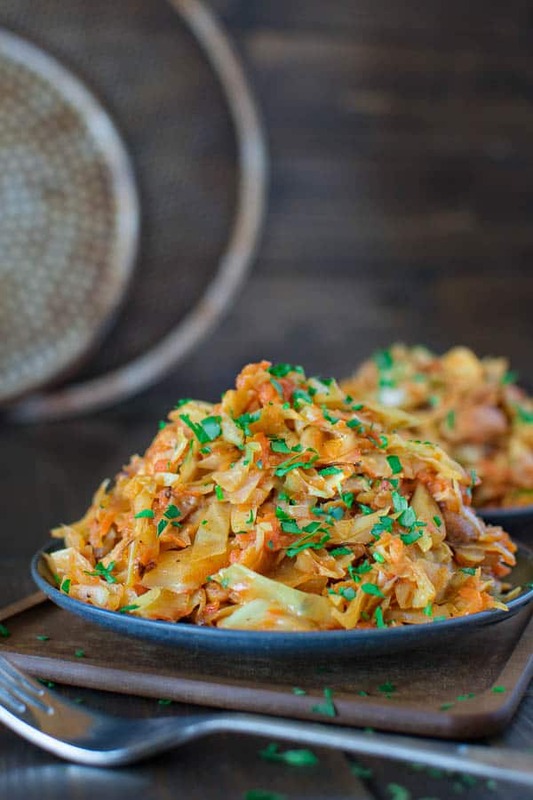 The cabbage end up being soft and almost melts in your mouth..
Another cabbage recipe that is better than Thanksiving Dinner is half a medium head shredded cabbage and 1 large shredded sweet potato sauteed in butter and a little chicken stock. I don’t even use salt. I have the luxury of a smoker, so I smoked the chicken to medium rare… they pick up lots of the wood flavor… I used Hickory because that’s what I had, but apple wood might be my first choice. Then followed the recipe as written. Awesome! I wouldn’t change a thing next time. I used local grown Creole Tomatoes for even more awesome flavor. To clarify, I smoked whole chicken thighs to about 150 F, then pulled the meat off the bones for the recipe. Thank you for posting this recipe. I will be looking through your other recipes also. I will try this recipe for sure. I usually just salute chicken breast with cabbage, onion, red and green peppers and then eat it most of the week as there is only me. It is my go to dish for one pot cooking. I love the addition of sweet peppers, Carol! Going to try it next time! Have a great week, friend! I’m looking forward to making this dish! 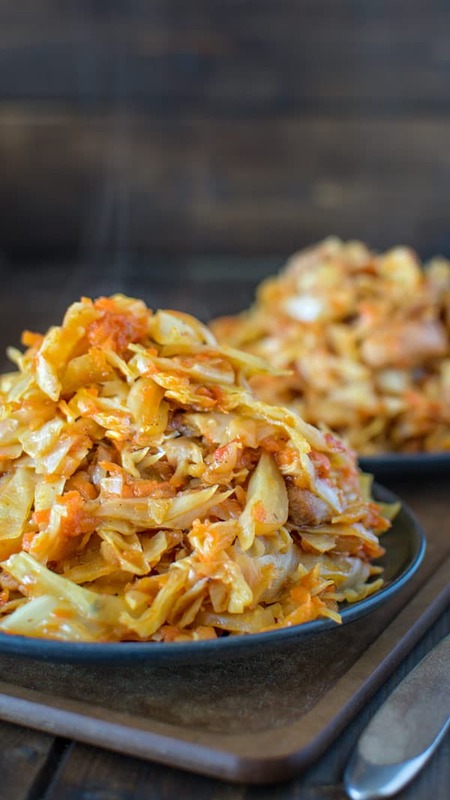 After reading through the comments, I was wondering if you could suggest an approximate number of cups for shredded cabbage? I don’t want to use too much. Also do you know roughly what the serving size is for each portion? Thank you! Hi Irene! I am cooking this dish for dinner tonight and I will measure precisely how many cups of cabbage I use and the serving size and I will get back with you! Just made this tonight and my husband and I loved it! I did opt for the garlic salt in lieu of the bay leaves and next time I might throw in some soy sauce. It was very flavorful and will definitely make it again. If you add onion it is even better. Hi Tania, I’m dying to try this recipe! I love cabbage and am always looking for new ways to eat it. My only concern is the amount of paprika used. Is it truly 3 TBSP? Do you use regular or smoked paprika? Hi Libba! Yes, I truly use 3 tbsp of regular paprika. It ads a lot of flavor. Hope you’ll enjoy this cabbage. 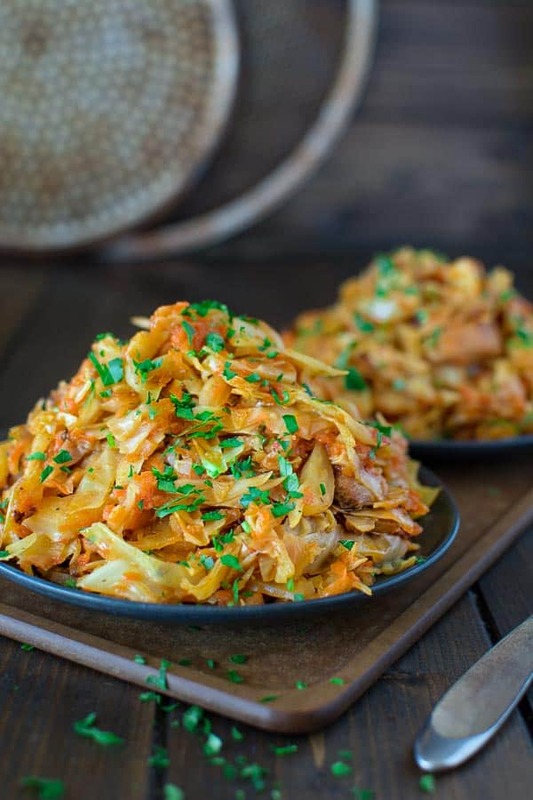 I love fried cabbage, but although it looked great on paper, we sadly found this recipe wasn’t for us….not enough chicken or general flavor…..
Hi Paula! I am sorry you didn’t enjoy the recipe. Most of the flavors develop from frying the chicken and then frying the cabbage with paprika. Once you add the broth, bay leaves, tomato (pureed or canned), salt and pepper and cook it for 45 minutes it should have PLENTY of flavor. Not sure what went wrong. Maybe you used large cabbage instead of small? I have 2 questions: 1) Do I use boneless and skin less chicken thighs and 2) Am I frying the pieces whole and then cutting it up? 1) I use boneless and skinless chicken thighs. 2) I chop the chicken before frying. Don’t skip the paprika, as it adds a lot of flavor. Make sure you use chicken, beef or vegetable broth. If by the end of cooking time you will have some liquid remaining – just cook the cabbage a little longer without the lid. Hope you’ll enjoy this recipe! That’s great! Bon appetit, Karen! I was very excited about trying this recipe! I followed it to the letter and was very sad to find that it was extremely bland. I altered it quite a bit, I added some soy sauce as well as some sesame oil and turned it into something a bit more with an Asian flair! I was very excited about trying this, as I absolutely love cabbage! However, sadly it was beyond bland. Are used everything just as described in the recipe so I’m not sure what could have been lacking. However, when I did alter it, it was delicious! Hi Heidi! I am sorry to hear the cabbage tasted bland. Glad, you made it work for you. Did you use chicken stock? It brings so much flavor. I used a can of Rotel tomatoes instead of the three regular tomatoes. We loved it! My husband had leftovers for dinner the next night and said he had been thinking about this dish all day! YUMMIE!! I made this for dinner a couple nights ago, fabulious!!!! !, I would give it 5 stars, delicious, nutritious, very easy preparation, Loved the chicken, I added onion, and a clove of garlic, used puréed canned tomatoes, I think i will use a andouille sausage next time. Doing whole30 diet. This looks good! Think I’ll try it for next week. Thanks! Cannot wait for you to try it, Meredith! Hi, This recipe sounds good. Can I substitute chicken breast instead of thighs? Would it still be good or maybe too dry?? How do you think a mixture of white and red cabbage would be. I’d like to sub a can of petite diced tomatoes for the fresh ones if you think that will be ok. Our fresh tomatoes aren’t good right now. This sounds so amazing and healthy…can’t wait to try! Feel free to use canned tomatoes, Gaylynn! I would suggest using about 4-6 oz. Let me know how it worked out! Can’t wait to try, went shopping and purchased all the ingredients, Sunday dinner, my family loves cooked cabbage and chicken, just not have tried them together, the meal looks yummy. I cannot wait to hear how your family enjoyed this dish, Deborah! Keep me posted! I found this bland and without flavor. It took forever for the liquid to simmer out and tgen it was mushy. Hi, Char! I am not sure why you were missing the flavor… Did you use chicken broth or water? There is only 1 cup of liquid in this recipe, it should evaporate after 45 minutes of cooking. However, if you still have the liquid after 45 minutes, just open the lid, increase the heat and cook it for a little longer. I also like this dish, but making a much easier version. Just wanted to mention that i never add any liquids since the cabbage itself normally would release quite a bit of water. And i like it to remain firm. Thus for those who don’t like the cabbage being too soft it may be the solution. That should work too, Anna! Thanks for sharing! Can you use somethig different than the tomatoes or leave them out? Just leave the tomatoes out, Pam! The dish will still taste great! This looks wonderful! If you are using canned purée tomatoes instead of fresh how much would you need? I would suggest adding about 1/3 cup of canned tomatoes, Seshi. Looks awesome! Any nutritional facts available like calories/fat and serving size? Thanks! Thank you for your comment, Heather! Unfortunately, I do not have the nutritional facts available. Try using an online nutrition calculator, such as http://www.myfitnesspal.com/recipe/calculator. All the best to you, friend! Will pick up the ingredients tomorrow and will have for supper. I love cabbage and know this will be a hit at our house. Thanks for posting! Thank you, Judy! I am sure your family will love it! Yay!!! You just made my day, Raylor! This sounds fabulous. love cabbage. But I would add a couple of onions. The go great with cabbage. Sure! Onions will definitely work in this recipe, Linda! Can I substitute canned, crushed tomatoes? Absolutely! I am sure you’ll enjoy this dish, Betty! Can we add some diced onion or do you think that will ruin the flavor? Onions will also taste great in this recipe, Rhonda! It’s basically chicken cabbage borscht. Delicious and easy. My tomatoes were a bit too juicy so I had more of a soup. That’s interesting, Karen. Try adding less stock and cooking without the lid next time. Thank you for the feedback! Cabbage is regular at home and I cook it with potatoes,peas o sometimes with shrimp. But never tried with chicken. I am gonna try this for sure. Cabbage is regular at my home too, Subhasmita! Let me know how you liked it! What a great recipe to combine two of my favorites: Chicken and cabbage! Thanks, Quinn! It’s my favorite recipe! I love cabbage! This looks and sounds delicious. Thanks for sharing. ? I’m making this for dinner tonight – it looks delicious. My husband loves cabbage and I’m always looking for new recipes. Your other recipes look delicious also. Definitely bookmarking your site for future use! Thank you so much, Chris! I can’t wait to hear how your husband loved the dish! Keep in touch!!! Just open a bottle of white vinegar and set it on the counter while cooking. You can do this with fish or any other smelly food you cooking. It’s turning into Autumn down here so I’m definitely pinning this for when I need a quick and easy, comfort-food recipe on a cold rainy day. Sounds delicious! ? I am making this tonight! I love sauteed cabbage but I usually make it with kielbasa or hot dogs (my grandma made it that way for us when we were kids, hot dogs + cabbage hold a special place in my heart). I have a head of cabbage and chicken thighs in the fridge and was too lazy to go get kielbasa on a holiday weekend (aka crazy lines at Shoprite). I never even thought to pair chicken with sauteed cabbage but this looks truly delicious, and now I will have a delicious healthy dinner without having to go out to the store. Thanks for the recipe! Looks fantastic, girl! I love cabbage too… it’s big in the Czech food I grew up with. It’s big in Ukraine too! Happy weekend, girlfriend! What a beautiful looking dish! We love cabbage in our house and this sounds like something we would love. Pinned it for later! Thank you for the pin! Have a wonderful weekend, Jamie! This is a healthy meal that I definitely need in my rotation as we do a healthy cleanse! Thanks for sharing! I hope you’ll give it a try, Sharee! This looks fantastic! Love cabbage and I’m always looking for new and delicious ways to cook with chicken thighs, too. That cabbage looks & sounds utterly divine. I have a cabbage from this weeks vegetable box delivery so will definitely be trying it.